Since introducing Proposal No. 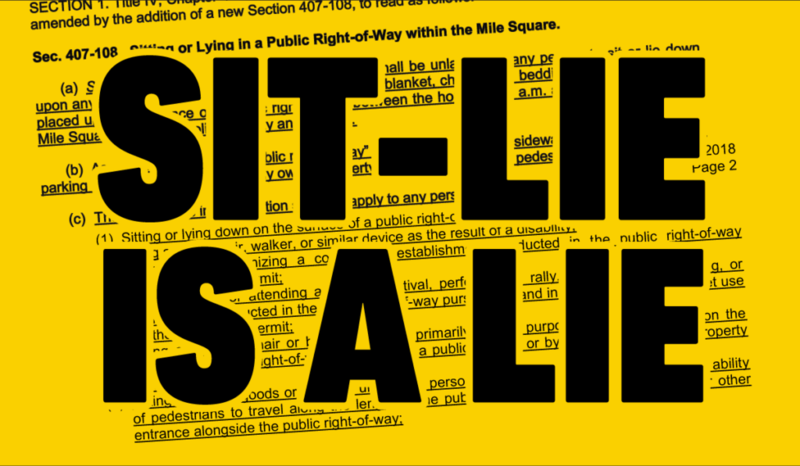 357 (2018), better known as the “Sit-Lie” ordinance, Indianapolis City-County Councillor Mike McQuillen and his wealthy associates have spread several lies about the ordinance, its intent, and why they want it passed. Several of the most egregious falsehoods have been selected and debunked by Answer Indiana. Truth: Sit-Lie targets people experiencing homelessness. According to a study conducted by the IU Public Policy Institute, 96% of people panhandling in downtown Indianapolis were experiencing homelessness, and 86% of them spent money earned while panhandling to buy food. Attacks on people who panhandle are attacks on people experiencing homelessness. Panhandling is already defined and regulated under state law (Indiana Code 35-45-17), which prohibits panhandling between sunset and sunrise—McQuillen’s proposal would extend this ban to 6 AM to midnight, which aims to prohibit panhandling during daylight hours. However, courts have found that panhandling is constitutionally protected free speech (Reed v. Town of Gilbert, Arizona; Norton v. City of Springfield). McQuillen’s proposal explicitly excludes anyone “[w]ho is engaging in constitutionally protected expressive activities which would otherwise be restricted by the limitations set forth herein.” People panhandling are therefore explicitly excluded from a proposal that is supposedly about addressing panhandling! People experiencing homelessness are not excluded from the ordinance, except if shelters are full—which ignores the fact that 77% of shelter beds in Indianapolis are provided by faith-based organizations, leaving those whose faith (or lack thereof) is incompatible with those shelters few options in this city, and no possible exemption from punishment under the ordinance. Truth: Sit-Lie does nothing to address safety. Forms of “aggressive panhandling,” including following someone being solicited or using abusive language is already prohibited by state law (Indiana Code 35-45-17-2), but none of these issues are addressed further by Sit-Lie. McQuillen accuses people who panhandle or lay on the sidewalks of making downtown unsafe. The perception of safety in downtown cannot be blamed on people experiencing homelessness as a group. Despite a sharp drop from 2012 to 2016, only now as numbers are beginning to rebound does McQuillen find paying lip service to addressing safety to be a priority. The safety of people experiencing homelessness is not considered. As temperatures drop, remaining outside and unsheltered becomes more and more dangerous, but Sit-Lie does nothing to provide aid to those in need. The health and safety of human beings should not depend on their economic situation. Truth: Sit-Lie is an attempt by wealthy corporations to push poor people out of sight. The same Downtown Indy, Inc. report says that “61% of downtown companies affirmed their 2017 business was stronger than 2016” and that “64% of these same companies project 2018 business will be stronger than 2017.” If Sit-Lie is so necessary, why are companies so confident that their business will be stronger this year? McQuillen’s campaign took in $21,525 from businesses and the wealthy elite working in the Mile Square financial district in 2017 and the first part of 2018, which totals over 40% of his total campaign contributions during the same time period. This compares to only $2,946.73 contributed by his Lawrence Township constituents. The economic injustice that creates homelessness is not considered. There are nearly 14,000 abandoned or vacant homes in Marion County, and since 2014 there have been fewer than 2,000 people experiencing homelessness during each annual point-in-time count conducted by the IU Public Policy Institute and Coalition for Homeless Intervention and Prevention. Each person experiencing homelessness could be given five already-existing vacant homes and there would still be thousands of vacant homes remaining. Instead of taking bold action to end homelessness in our city, McQuillen and his wealthy allies are attempting to demonize people experiencing homelessness to justify their removal—not by ending homelessness, but by pushing them to other parts of the city so that businesspeople won’t have to be confronted by the realities of the oppression created by the very system they benefit from. If passed, the ordinance would establish a fine that would be levied against the most economically-oppressed population in our city. If unpaid, the fine could escalate to prosecution, creating a street-to-prison pipeline for people whose only crime was having nowhere to go.